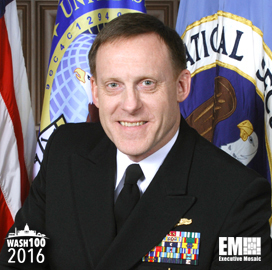 Executive Mosaic is honored to announce Navy Adm. Michael Rogers, director of the National Security Agency and chief of the U.S. Cyber Command, as an inductee into the 2016 edition of the Wash100 — Executive Mosaic’s annual selection of influential leaders in the government contracting industry. Rogers, also head of the Central Security Service, told attendees at a January Atlantic Council forum that NSA has partnered with companies to help prevent the use of social media by the Islamic State organization and other terrorist groups to recruit youth and promote extremism. In December 2015, he described to an Intelligence and National Security Alliance event the NSA’s role in efforts to standardize information technology operations within the intelligence community through the adoption of the Intelligence Community IT Enterprise program. Rogers also announced in that same month his plan to subject the agency to a reorganization in 2016 that would focus on employee development, organizational structure and innovation. As part of efforts to counter cyber attacks, Rogers released a vision statement titled Beyond the Build: Delivering Outcomes Through Cyberspace that calls for Cybercom to integrate cyber operations with military and national security initiatives and set up a control-and-command system. “We [must] maintain an operational mindset, with our networks and cyber capabilities led by commanders who understand they are always in real or imminent contact with adversaries,” he wrote in the document. Prior to NSA and Cybercom, he was responsible for all cyber warfare programs for the Navy as commander of the U.S. 10th Fleet and the U.S. Fleet Cyber Command. He oversaw cryptology-focused support operations onboard U.S. surface vessels and submarines in the Mediterranean and Arabian Gulf. Rogers also served in the military’s Joint Staff as head of computer network attack and defense operations and as special assistant to the chairman of the Joint Chiefs of Staff. Executive Mosaic extends its congratulations to Adm. Michael Rogers and the NSA team for their selection to receive this award.